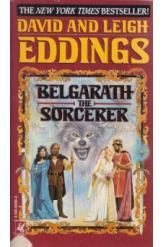 Belgarath the Sorcerer David and Leigh Eddings. Book in very good condition, all pages intact. The world was young, Gods walked aomng their mortal children. Then the Dark God Torak split the world and the God Aldur and his disciples began their task to set destiny aright. This led to a monumental war of men and kings and Gods.